Develop your skills in effective investment performance evaluation and manager search and selection with the Certificate in Investment Performance Measurement (CIPM®) Program. Deliver more actionable investment insights. Improve manager search and selection. Develop skills in performance appraisal, attribution, and presentation. Increase your understanding of factors that drive portfolio risk and return. Demonstrate your commitment to maintaining globally relevant and practice-based investment performance evaluation skills. 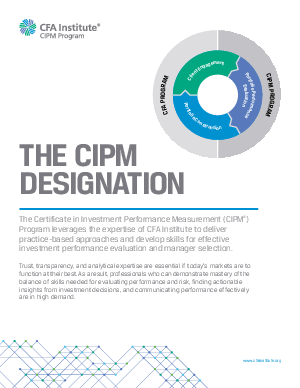 Fill out this form to receive more information about the CIPM Program and download the program fact sheet.